I felt so many tremors and tensions yesterday… like an earthquake was moving through while the logistical choices, research, etc were felt into by Gabriel and me as we co-lead our next movements toward Europe as not just a destination, but somewhere to BE for as long as we can be. Somewhere to continue to upgrade our service of love, somewhere to continue to explore the timelines and lifetimes alive in a geography so rich with ‘history’ that isn’t really ‘past’ at all but billowing and vibrating in the NOW. This is a time when in some ways we are being asked to jump. To take a leap of faith and trust, even if that feels beyond reach for parts of us in moments as anxieties about money or the ‘how’s’ of everything surface. This is not just a process for us personally along with beloveds of ours who we will be making this shift with, but also for many others who are at the crux of big changes and collapses of their current timelines. To unplug, to move on from, your current and known reality always requires a leap of faith. This faith is not just in some force or power outside of you, but in YOU and your soul, ultimately. It is an invitation to take some known risks, to be at the edge of discomfort and explore it all. To get curious about what’s rumbling and how deep instead of avoiding the rumble and what it brings up. There’s so much more on the other side of each process, no matter how big, that we inhabit around action-taking, next steps, ways to approach our impending timeline possibilities. There’s so much MORE that we get to BE and experience ourselves as once we are through the forest of choice points and challenges that come up with every big life change. The corridor of big life change is opening up. Will you take your next step into it, even if for now that step feels small? As I ended my last blog entry months ago, I was driving away with a new sense of vitality and direction. I had made a leap of faith. Well, things did not turn out as “planned”. While there was awareness that anything could change, a part of me assumed that it would be a while if it did. How quickly life can change when you are living the SoulFullHeart Way of Life. As I settled into my new surroundings, parts of me were still a bit traumatized by the sudden transition. I could not quite feel grounded in my new “home”. This took a toll on my relationship, as I just could not “show up” the way she desired and deserved. There were other factors on both of our sides, but I choose not to elaborate on them here. Eventually, we completed our time together and were both led to the “unknown”. What now? A part of me thought about leaving and starting a new life somewhere else. Actually, he still does. I felt it would be running away and denying all that I had come to realize about why I was here in the first place. I was here to get to know myself without the distractions of my old life. Here, I am “unknown”. I was used to responding to the needs and passions of others. Now, I am responding to my needs and my desires. They are very small in the moment, but it is a start. While all this happening, I have a part that is very anxious of the future. He has been so used to planning and strategizing a path to knowingness. To “know” builds a sense of security even though there really is no such thing. It is a perception, an illusion of safety that helps him to feel comforted. This is what most of us tend to do with our lives. Build a construct, a castle if you will, so that parts of us can be okay with our existential fear of not knowing a damn thing. It is a scary place, and I don’t blame them for doing so. However, the castle is made of sand, and eventually will get swept away, this life or the next. Do I have any clue what happens next? Not really. I have some thoughts and feelings. 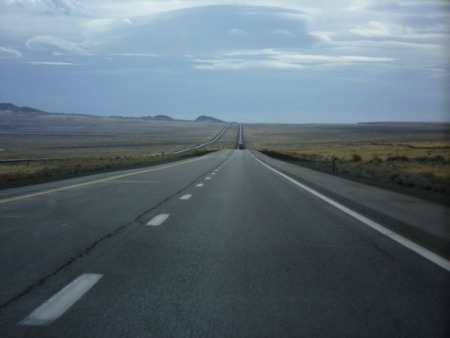 While the open road is full of possibility and adventure, it is also lonely and scary. But I feel this is what I signed up for. To be living in the unknown. I can have a general desire for my future, but it is just a marker, a place to drive and see what happens. I can spend my time worrying about what “may” lie ahead. I can spend my time trying to “figure out” how I got here. Or I can be in this moment, feeling all that I am feeling, and making small steps into The Living Unknown.